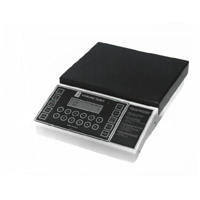 The Model 825 bench scale is easy to use, accurate and dependable. It can weigh or count parts weighing a fractional ofÂ a gram to pounds. Features include a bright easy to read LCD display and RS232 output. Weight can be displayed in pounds, Kgs. or grams. The 825 can operate on a optional internal 12 VDCÂ battery or 118 VAC. With optional circuitry a second scale platform can be connected. All steel industrial enclosure. Portable cart to transport the 820 where needed.Â Painted mild steel 30" h x 24"d x 30"w.